"Go West" Feral Woman: "I got it from my grandma"
"I got it from my grandma"
Recently my oldest daughter convinced me that I should get AncestryDNA tested. "Like Wisdom Panel for Dogs?" Im pretty sure we are related to the Siberian Ice Maiden. This is my Grandma Helen. who would feed you LOTS of food. Even if you werent hungry. Remember that post I wrote about my Uncle Eddie? Well this is Uncle Eddie's mom. Shes where i got my fashion sense from. put my Grandpa Leo in this photo. My Grandpa Leo was a city boy. And apparently my Great grandpa Joseph knew this. while not looking at it. or even looking at it. you be in danger, boy. My grandpa Leo still tried to win my Grandma Helen's heart. 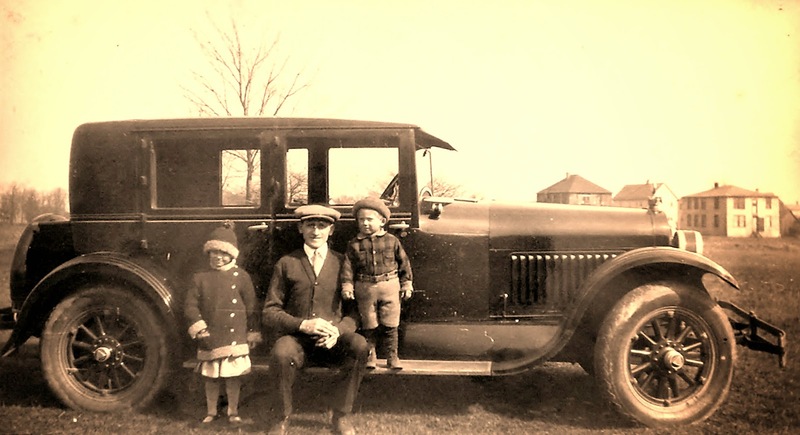 Anyhow, my Grandpa Leo liked having those fancy Automobiles. My Grandma Helen wasnt impressed with that. an off the track Standardbred Race horse! My grandma Helen was the hit of the neighborhood! Look at her, all dressed up with her friends! And shes only got one hand on those reins! 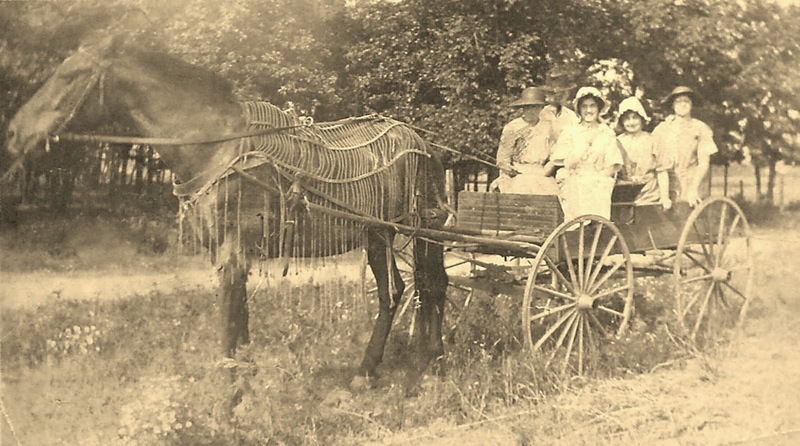 All the neighbor ladies would hit Grandma Helen up for a ride into town. So it was a very fast ride into town. Kind of like a supersonic horse-train version. That must explain why his ears are back. Breaking the speed limits do that to a horse. up in the Northwoods of Wisconsin! 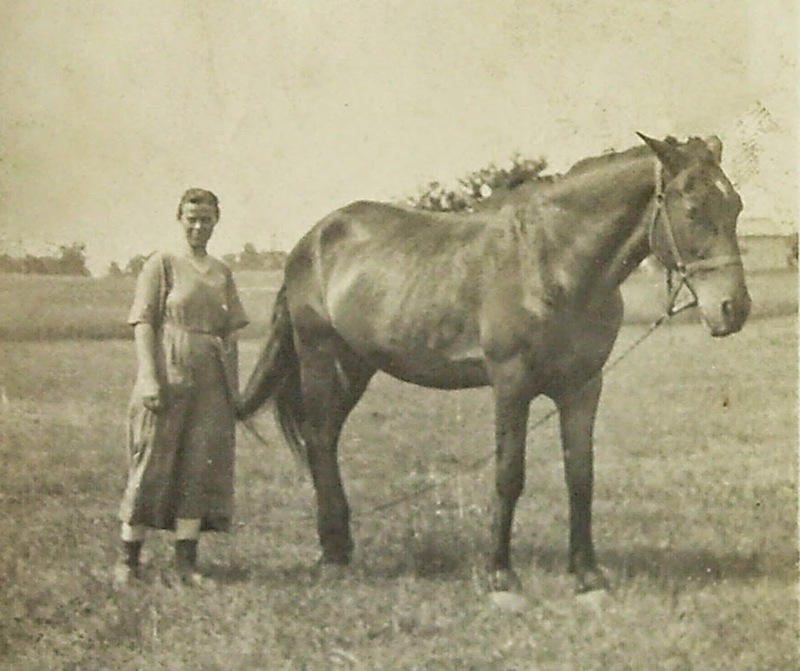 But my Grandma Helen really liked her horse best. that she had different wagons for different chores! Look how shes sitting, holding those reins. 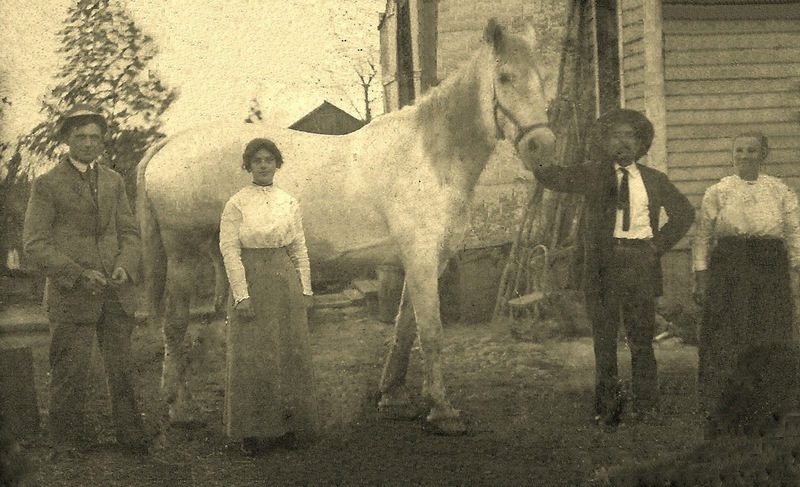 She was a confident horseman. 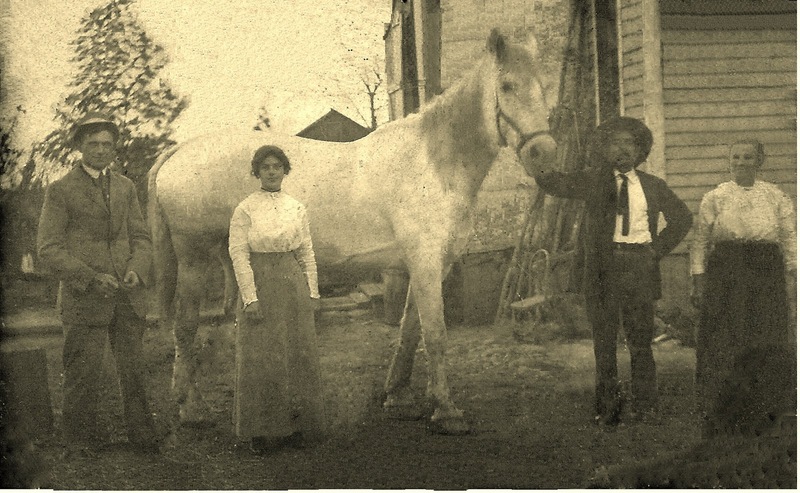 where I got my horseman DNA! I am pretty sure I have told you before that you have the coolest family. I know exactly where you came from by the photos. You came from an awesome hardworking never quitting always believing they would make it fun loving family who had one wicked sense of humour. Oh yeah that sounds like someone I know. That horse gene is a funny one- it skips generations. Best. Post. Ever. What wonderful photographs of wonderful relatives! Fantastic post! I like your spin on life! Those old family photos tell your story for sure; I enjoyed this post. Where have you been, woman? These photos tell quite a story. I can identify with your family. OMG. I am so completely vibrant green with envy that you had the relatives you did. I want a Busia!!! LOVE the header photo. It speaks volumes. Great post! Love all the photographs, talk about amazing history......and plenty of memories! Also love the new header and Oh, that we should all be so lucky to have relatives/ancestors like that. Wonderful. Love that header photo! You look so young.... Is Ebony really 18 years old now? Those are some great old family photos! 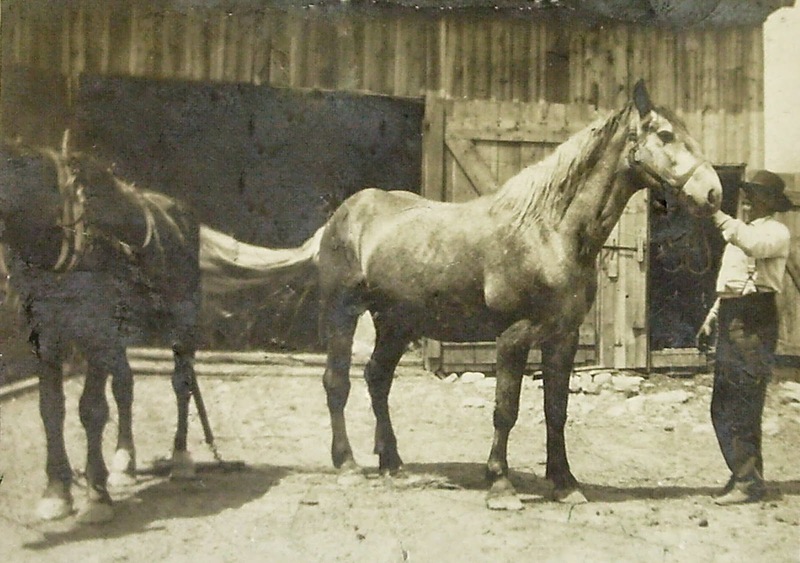 Love the fly netting on the Standardbred in that one photo, seems your grandma took good care of her fine fast horse. You have some great photos of your family! I did a DNA test through Family Tree DNA. Very informative and fun! OH how I loved seeing your old family photos, there are so many stories in those photos, what a treasure to have! Looks like you come from a long line of great people!! Thanks for the trip back in time, introducing your ancestors. The apple did not fall far from that tree! You can honestly say you got your horse sense from your kinfolk!